« Long Live Asphalt! But, How Long? A retaining wall is functional, stylish, and versatile! Retaining walls are functional, stylish, and versatile. They can be used for anything from a cosmetic change to keeping flooding away from your home. A retaining wall is totally customizable to fit whatever you may need it for. The possibilities are endless! Most improvements you make to your home will increase its value, so it should be no surprise that a retaining wall can do this as well. 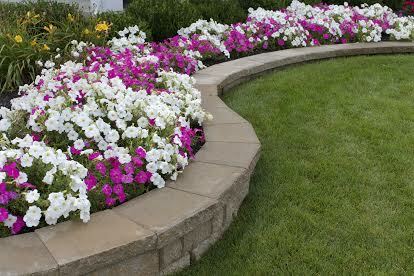 A retaining wall is an attractive garden addition. You can separate different types of plants within the same section of your garden. Besides all of the different choices for materials you can use to build your retaining wall, there are also several different ways it can be constructed. Gabion wall- metal mesh is filled with stones and bent to fit whatever shape is needed. Dry stack wall- made of stone but without mortar, so the stones are movable. Traditional stone and mortar wall- made of stone and mortar, so it is sturdy and durable. Once a retaining wall is constructed, there is very little that needs to be done to maintain it. In the case of dry stack walls, there’s only the occasional moving around of stones. Retaining walls are very low maintenance. Once they’re built, that’s pretty much all that needs to be done. Retaining walls are meant to stand up so harsh conditions, so it is very rare for one to require repair. Most retaining walls are made from materials that can be sourced from relatively close by, so they’re accustomed to the local weather conditions. A retaining wall is a great investment in your home, because it’s stylish and functional, and won’t require lots of time or expensive repairs. When constructed properly, a retaining wall can withstand quite a bit of weight. A retaining wall will prevent soil erosion and water damage for years to come, with very little maintenance and few problems. Is some or all of your yard on a slope? Build a retaining wall to keep soil erosion from becoming a problem. If your home is at the bottom of a hill, you can build a retaining wall to prevent flooding. If you are looking for help designing the best concrete for your home or business, Atlantic Maintenance Group is ready to help you with our variety of landscaping, asphalt, snow removal, and concrete maintenance services. We are experts in our field and we are prepared to meet your need with a price and product that will leave you grinning. If you are interested in getting a free quote or more information, visit us online or give us a call at 410-768-4720. To see examples of our work and stay up to date on our specials, follow us on Facebook, Twitter, Pinterest and Google+. This entry was posted on Friday, July 28th, 2017	at 12:13 pm	and is filed under Retaining Walls	. You can follow any responses to this entry through the RSS 2.0	feed. Both comments and pings are currently closed.